O/o District Election Officer, Kamrup Metro. 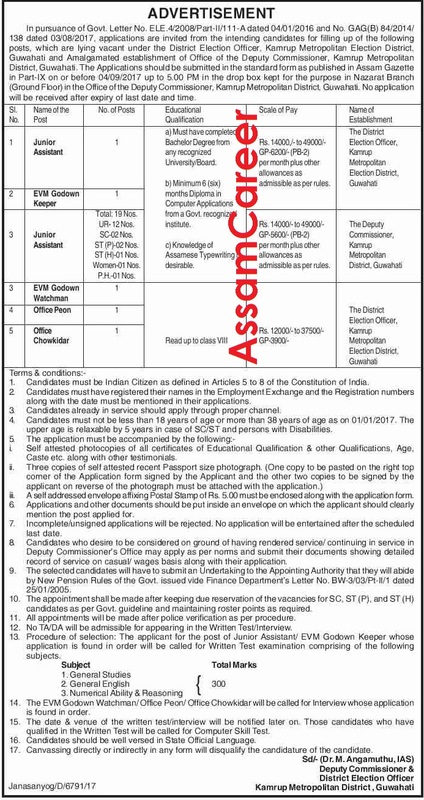 Applications are invited from the intending candidates for filling up of the following posts, which are lying vacant under the District Election Officer, Kamrup Metropolitan Election District, Guwahati and Amalgamated establishment of Office of the Deputy Commissioner, Kamrup Metropolitan District, Guwahati. Educational Qualification: Must have completed Bachelor Degree from any recognized University/Board. a) Minimum 6 (six) months Diploma in Computer Applications from a Govt. recognized institute. b) Knowledge of Assamese Typewriting is desirable. Age: 18 to 38 years of age as on 01.01.2017. The upper age is relaxable by 5 years in case of SC/ST and persons with Disabilities. Fees should be deposited only through 'Treasury challan in the Head of Account "0070-Other Administrative Services-60-Other Services-800-Other Receipts". Selection Process: Written test for Junior Assistant/EVM Godown Keeper. Interview for EVM Godown Watchman/ Office Peon/ Office Chowkidar. How to apply: The applications should be submitted in the standard form as published in Assam Gazette in Part-IX on or before 04.09.2017 up to 5.00 PJM in the drop box kept for the purpose in Nazarat Branch (Ground Floor) in the Office of the Deputy Commissioner, Kamrup Metropolitan District, Guwahati. The application should be submit ONLINE only. No application will be received after expiry of last date and time. a) Self attested photocopies of all certificates of Educational Qualification & other Qualifications, Age, Caste etc. along with other testimonials. Advertisement Details: Pl check here | here .